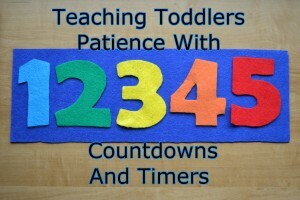 Patience is an incredible skill to have, yet also really difficult to teach to toddlers. Thankfully, I’ve discovered some great tips and tools that helped me teach my boys how to wait patiently. A timer or a countdown is a great tool in teaching patience, but learning how to implement these smoothly and without fuss can be a bit tricky. We often introduce the concept of waiting at a time when our children are not ready to wait. A toddler asks for a drink and we say, “Just a minute” when we realize the cup is dirty and needs to be replaced. Terribly thirsty, the toddler screams, understanding only that you are taking the cup away instead of handing it over. You’re cooking with a cast iron pan when the toddler comes over, requesting to be picked up. “One second” you say, unwilling to have the curious hands near the incredibly hot pan. Your toddler stands by your feet and calls your name repeatedly, or even tries to cling to your leg. Sound familiar? Pick a time when you are both calm and happy to begin using the timer. In behavior therapy, it is taught that the best way to change behavior is to have the consequence as close to the behavior as possible. So, if you want the child to quickly learn that something will happen once the timer goes off, then it helps to perform the action as soon as the timer goes off. At the same time, you don’t want to accidentally reinforce negative behavior. If your toddler is screaming impatiently for the drink of water when the timer goes off and you hand the drink over, the child might associate screaming with obtaining the drink, rather than the timer itself. In order to avoid negative reinforcement, when first introducing your children to the timer, only use it for short periods and for items or activities that won’t cause a fuss. My husband was absolutely brilliant in introducing the boys to the concept of the timer. He would give them part of a snack, set the timer for a shorter period than it took for them to clear their plates, then give them the rest of the snack after the timer went off. Once they got used to the connection, he set the timer for longer and longer periods of time until there was a period of waiting between the start of the timer and the reward. Since my boys had come to trust that they would get the rest of their snack once the timer went off, they both waited patiently. Over time, we were able to lengthen the waiting period and move the waiting period to the beginning of the meal or activity. If your children are impatient, and fuss and whine a lot, then you can teach them the concept of “waiting hands”. “Waiting hands” are little movements done with the hands that usually distract toddlers from fussing due to impatience. If your child is fussing when you are ready to give an item over because the timer has gone off, kindly ask to see their “waiting hands” and, the vast majority of the time, the toddler will stop fussing and show you their “waiting hands”. The actual movement doesn’t matter. It just functions as a distraction. Again, like the timer, “waiting hands” have to be taught while the child is calm. Since we started with such short periods, we made it easy for our boys to wait calmly and, when they did so, we thanked them for it. Pick a timer that the toddler will love. 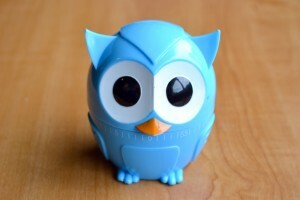 My boys loved owls, so we got these cute little owl timers. Although I now use my smartphone as my timer, I think seeing the timer in the beginning helped the boys learn the concept much quicker. If you do use a timer like this, get something small and cheap so that you can stash them all over. Very recently, my son found of these stashed in the back of a cabinet and had fun setting it off repeatedly. Every time it went off, he announced it was his turn. I’ve found that it helps to let the child start the timer by pressing the button, flipping the hour glass, turning the owl, etc. I try to give my toddlers as much agency as possible. When mine are fighting over a toy, just the act of pressing a button on the timer can calm them down. For longer waits, use countdowns. 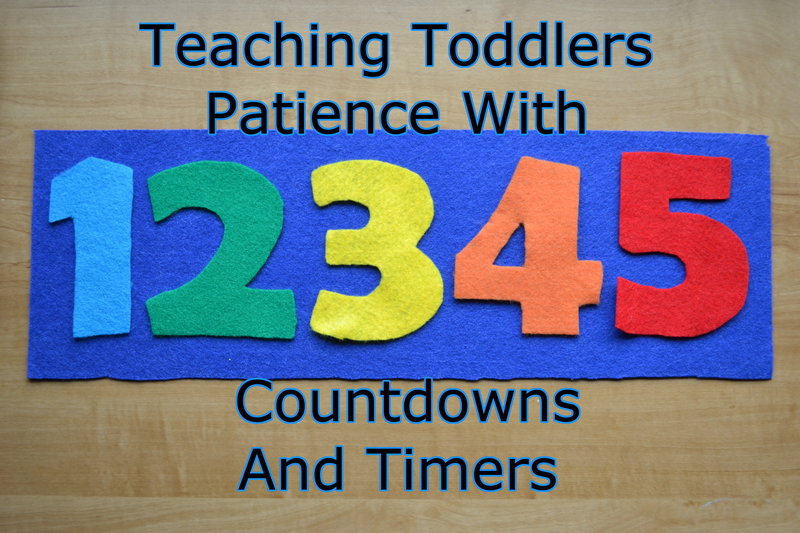 Timers are great for short waits, but toddlers have short attention spans and can grow very impatient with things that take much longer. I prefer using a countdown for long waiting periods where they will be more patient if they can see how much time they have left to wait. There are many ways to set up a countdown, such as with a chalkboard or white board, magnets, etc. I chose to use felt colored numbers on a felt board so that it would be lightweight and easy to bring a copy with me. 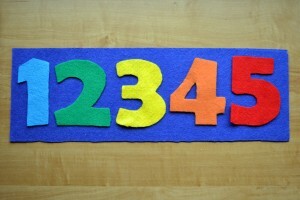 It’s also a great way to emphasize colors and numbers! If your toddlers are like mine, then this will need to be kept out of their reach to be effective. Once mine learned that when all numbers came down, the countdown ended, they were sneaking over to pull the numbers down. You can use a timer with the countdown, or independently. I found that my boys picked it up without me having to use a timer between each number, but many children will get upset with not being able to immediately take down the next number without a timer to remind them to wait. We’re big on accepting emotions and it’s unrealistic to expect a toddler to remain patient all the time, especially when so many adults have trouble with patience! I try to make sure I’m not pushing my 2 year olds beyond what’s reasonable to expect for 2 year olds. I find that not expecting a child to be patient when they are hungry, upset at something, tired, or needing affection goes a long way to inspiring them to be patient in normal circumstances. I also try to set a good example by being patient with them. I hope this helps and I’d love to hear more tips and tricks!